Nanotechnology is an emerging field within science that is in focus of public interest all over the world. The public interest and the interdisciplinary character are the sampling criteria for choosing nano science as a case for knowledge sharing (see deliverable D8.2). For this purpose we started the analysis of the case study with CENIDE, the Center for Nanointegration at the University Duisburg-Essen. First we collected press releases, press items and publications from the nano technology center CENIDE located at the University Duisburg-Essen. Press releases are announcements produced by a small team mainly responsible for public relations and networking of the nano center. Press items are new articles produced by press and journalists about the nano technology center. Publication abstracts are abstracts of the publications by scientist belonging to the research network. The following diagrams show the comparison of the frames (= topic clusters) for the publication abstracts and for the press releases in the year 2008 with the different colors indicating different frames. Figure 1 shows the topics, based on the scientific discourse that means with publication abstracts as data basis. As we can see, besides of global topics (white frame down side) the other main topics for the frame are Spintronics, Spectroscopy, Anisotropy, and Growth of surfaces. In comparison, Figure 2 shows the CENIDE press items for 2008, representing the topics within the public science communication. Here we can see that this network also contains Spintronics that can also be found in the network extracted from the publication abstracts. Since the network is extracted from press items academic titles are also included in one component. The orange frame in the upper left shows clearly the new master program in nano engineering. In general we see that the network based on the press releases differs significantly from the network based on the publication abstracts due to the public relation character of press releases. The press items which are based on the press releases and published by media are more similar to press releases. But they also differ in the sense that more contextual information added by the media can be found in the network. Concerning the nanotechnology case we can say that using the network of co-occurring words technique enables to detect a change in semantics when the topic moves from the scientific to the press context. In the scientific context, CENIDE is related to specific knowledge and basic research. In the press releases, CENIDE and nanotechnology are strongly related to events, offers and promoting these offers. The press seems to be interested in the persons behind the research and the areas of application. In terms of social impact it is important to tell about these people. How are productivity and cooperation (co-authorship) related? Are the most productive authors also the most collaborative ones? Which role does collaboration play in the field of nanotechnology? To answer these questions, we took a look at the productivity, measured by the degree centrality and the collaboration, measured by the betweeness centrality of the researchers. The data set uses the Pajek partition structure to include the different institutions CENIDE, NIM, and KIT. 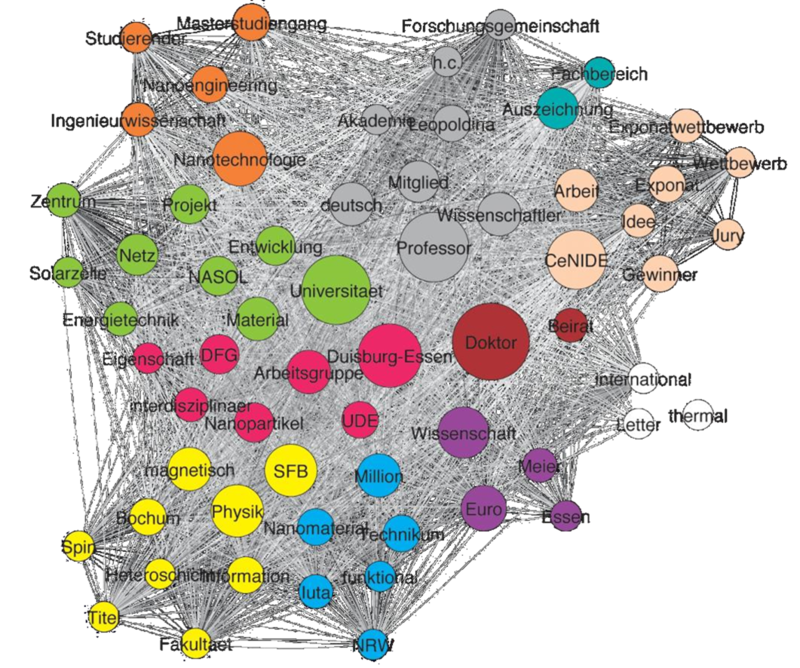 One result we got based on the comparison of the degree centrality and the productivity of researchers is that productive scientists not necessarily gain a high centrality position in co-authorship networks. While confronting the researchers with these results some of them were surprised, especially the high productive researchers who usually force single authorship journal publications. They didn’t expect the importance of a collaborative culture of publishing. For nanotechnology it is important to show the difference between degree centrality in co-authorship networks and productivity of individual researchers since there are different publication cultures included in the domain. While for example traditional scientists from the research area of physics usually publish alone or with only few co-authors, mechanical engineers might have a culture of collaborative and interdisciplinary publishing. Especially in cases of young researchers we could observe that one young researcher with a high centrality score also receives a lot of grants. Another interesting case is the case of one researcher who is not well known for a special paradigm but has developed and optimized methods to produce high amounts of nano particles. In his role as a supplier for nano particles he contributes to different research groups and their research within the center. This leads to his presence as co-author in several papers and he gains a high centrality as a consequence in the resulting co-authorship network. 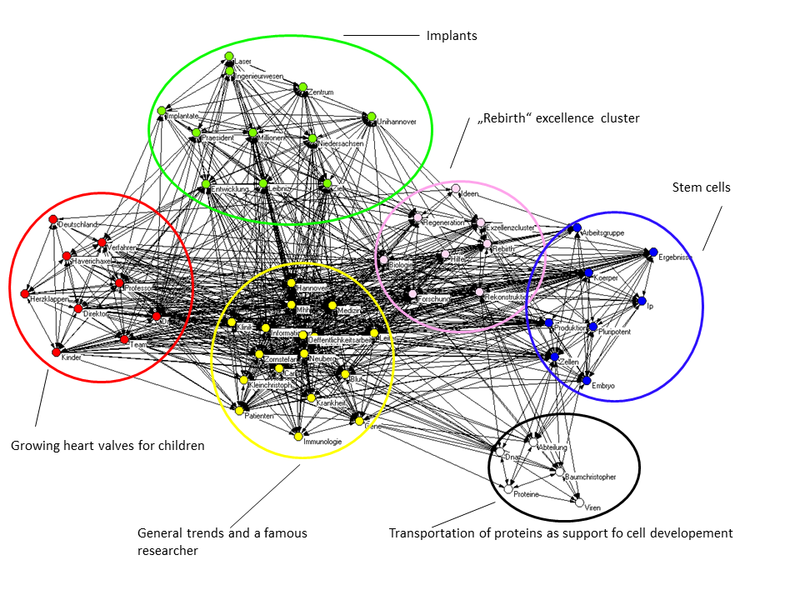 This shows and underlines the findings from interviews with members of CENIDE and the Network Text Analysis saying that especially enabler roles and providers of enabling technologies are important for the success and impact of scientific communities. Especially universities who usually are interested in hiring famous researchers should consider that enabling is one important factor in the competition to get the best scientists. The case of biotechnology is based on an excellence cluster in Hannover, Germany called Rebirth. It was founded in 2006 as a research cluster addressing difficult health problems especially related to the heart. It seeks the synergy between Medicine, Biochemistry, Physics, Chemistry and Engineering to overcome limitations in traditional Medicine. 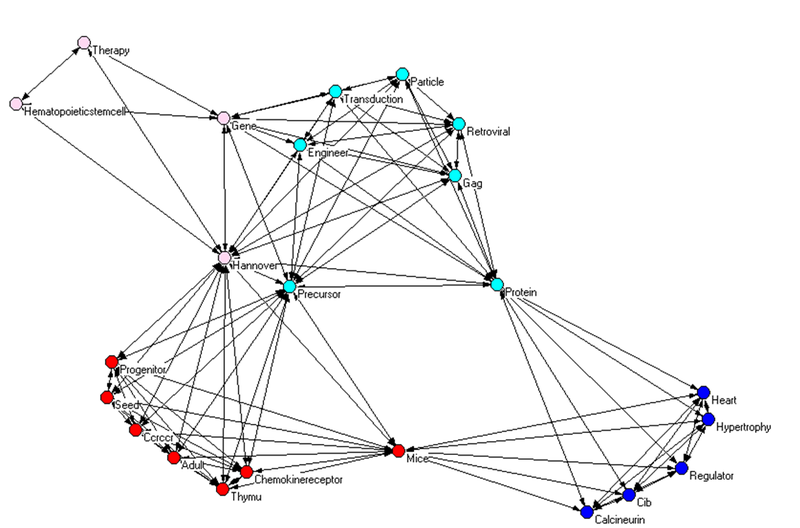 The research design is similar to the nanotechnology case based on Network Text Analysis. Here we also conducted both approaches by Diesner/Carley and Leydesdorff/Hellsten to compare topics in press releases and topics in publication abstracts for the years 2008 to 2011. In general both approaches lead to very similar results. Related to the social dimension they very clearly demonstrate that the different discourses may show and also hide different things. In both approaches we can observe that the scientific discourse represented by the publication abstracts contains the term mice which refers to animal testing. Figure 6 shows this based on the Leydesdorff/Hellsten approach. In contrast the press releases are mainly dominated by terms referring to children and reconstructive therapy approaches especially related to heart issues. In case of children and their growth process it is evident that therapy based on stem cells is one important path to heal heart diseases. On the other hand it seems that public communication in this case is avoiding unpopular topics like animal testing. Healing children with heart diseases seems to benefitthe image of an excellence cluster. In sum we can state that for both cases (nanotechnology and biotechnology) the Network Text Analysis approaches are a very practicable way to show differences between public discourses and scientific discourses. Press releases and the more difficult to collect press items are a good way to capture the public discourse. In contrast publication abstracts are practicable since they are available usually without a subscription to specific databases or journals. The difficulty is to understand and interpret the scientific terms and the identified frames. In case of nanotechnology the possibility to interview researchers provided a good way to understand the specifics by asking the scientists. In contrast, the case of biotechnology – without the possibility to interview experts – required intensive internet research to understand the unknown terms and to interpret the found frames. Diesner, J., & Carley, K. M., 2005. 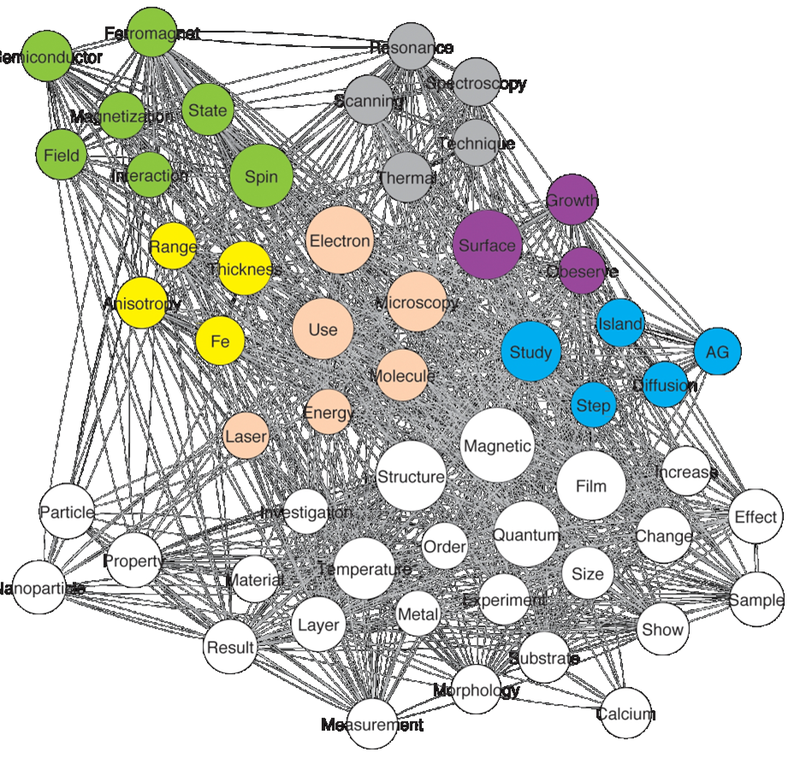 Revealing Social Structure from Texts: Meta-Matrix Text Analysis as a novel method for Network Text Analysis. In V. K. Narayanan & D. J. Armstrong, Causal Mapping for Information Systems and Technology Research, 81-108. Harrisburg, PA: Idea Group Publishing. La nanotecnología es un nuevo campo dentro del ámbito científico y centro de interés en todo el mundo. Tanto el interés que genera, como su carácter interdisciplinar son criterios que convierten a la nanociencia en un caso de estudio para el intercambio de información (véase el documento D8.2). A tal fin, comenzamos el análisis del caso con CENIDE, el Centro de Nanointegración de la Universidad de Duisburg-Essen. En primer lugar, recopilamos comunicados de prensa, artículos y publicaciones del centro tecnológico de nanotecnología CENIDE situado en la Universidad de Duisburg-Essen. Los comunicados de prensa son anuncios hechos por un pequeño equipo responsable principalmente de las relaciones públicas y redes sociales del centro nanotecnológico. Los artículos de prensa son artículos nuevos escritos por la prensa y los periodistas sobre el centro nanotecnológico. Los resúmenes de una publicación son los realizados por científicos pertenecientes a una red de investigación. Los siguientes diagramas muestran la comparación de las agrupaciones de temas (=topic clusters) para los resúmenes de publicaciones y los comunicados de prensa del año 2008, en el que cada color representa las diferentes agrupaciones. La Ilustración 1 muestra aquellos basados en el discurso científico que corresponden a los resúmenes de las publicaciones tomados como base de datos. Como se puede observar, además de las agrupaciones de temas globales (agrupación blanca en el lado inferior) también se encuentran las otras agrupaciones principales: Espintrónica, Esprectocopia, Anisotropia y Crecimiento de superficies. La ilustración 2 muestra, en comparación, los artículos de prensa de CENIDE para el año 2008, que representan las agrupaciones dentro de la comunicación de la ciencia destinada al público. Como se puede observar, en esta red se encuentra también la Espintrónica, que además puede hallarse en la red extraída de los resúmenes de publicaciones. Puesto que la red se extrae de los artículos de prensa, se incluyen además en un componente las denominaciones académicas. La agrupación naranja en la parte superior izquierda muestra con claridad el nuevo programa máster en nano ingeniería. Podemos ver, en términos generales, que la red basada en los comunicados de prensa difiere significativamente de aquella basada en los resúmenes de las publicaciones, principalmente debido al carácter público de los primeros. Los artículos de prensa basados en comunicados y publicados por los medios se asemejan más a los comunicados, pero se diferencian también de éstos en que los medios proporcionan más información contextual en la red. En lo referente al caso de la nanotecnología, podemos decir que el hecho de usar la técnica de red de palabras concurrentes permite detectar un cambio en la semántica cuando el tema se desplaza del contexto científico al de la prensa. En el contexto científico, CENIDE está vinculado al conocimiento específico y la investigación básica. En los artículos de prensa, CENIDE y la nanotecnología comunican actividades, ofertas y promoción de dichas ofertas. La prensa se interesa por cada una de las personas responsables de la investigación y sus áreas de utilidad. En términos de impacto social es importante hablar de estas personas. ¿Cómo se relacionan la productividad y la cooperación (coautoría)? ¿Son los autores más productivos también los más buscan la colaboración? ¿Qué papel desempeña la colaboración en el campo de la nanotecnología? Para responder a estas preguntas, examinamos la productividad científica, medida por el grado de centralidad y la colaboración, que definimos como la centralidad de intermediación entre los investigadores. El conjunto de datos utiliza la estructura de división de Pajek para así incluir a las distintas instituciones CENIDE, NIM y KIT. Uno de los resultados obtenidos basándonos en la comparación del grado de centralidad y la productividad de los investigadores es que los científicos productivos no obtienen necesariamente una alta posición central en las redes de autoría compartida. Al exponer a los investigadores con estos resultados, muchos de ellos se sorprendieron, especialmente aquellos con una mayor productividad que normalmente potencian la autoría individual de las publicaciones, puesto que no se esperaban la importancia de la publicación compartida. En el caso de la nanotecnología es importante mostrar la diferencia entre el grado de centralidad en redes de autoría compartida y la productividad individual de los investigadores puesto que existe una cultura diferente en cada caso. Mientras que los científicos tradicionales del campo de la investigación publican por lo general de manera individual o contando con algún que otro autor, los ingenieros mecánicos desarrollan una cultura de publicación interdisciplinar y en colaboración. En el caso concreto de investigadores jóvenes se puede observar especialmente el hecho de que reciben además más subvenciones si cuentan con mayor grado de centralidad. Resulta interesante también el caso del investigador no muy conocido por un aspecto concreto, pero que ha desarrollado y optimizado métodos que producen ingentes cantidades de nano partículas. Como proveedor de nano partículas, contribuye con los diferentes grupos de investigación y su desarrollo en el centro, lo que produce como resultado su participación como coautor en varios artículos proporcionándole una mayor centralidad como resultado de la red establecida de autorías conjuntas. Todo esto pone de manifiesto los hallazgos derivados de las entrevistas con miembros del CENIDE y del Análisis de Textos mediante Red, que señalan que las funciones de facilitador y proveedor de tecnologías son importantes tanto para el éxito como el impacto de las comunidades científicas. En concreto las universidades, que normalmente procuran contar entre sus filas con investigadores de prestigio, deben considerar que para conseguir a los mejores científicos, éste es un factor importante a tener en cuenta. El caso de la biotecnología se basa en un clúster de excelencia de Hanover, Alemania, denominado Rebirth1, fundado en el año 2006 como clúster de investigación que aborda los problemas de salud, en particular los relacionados con el corazón. El mismo busca la sinergia entre la Medicina, Bioquímica, Física, Química e Ingeniería con el fin de superar las limitaciones de la Medicina tradicional. El diseño de la investigación es parecido al caso de la nanotecnología basado en el Análisis de Textos mediante Red. Además realizamos aquí ambos enfoques usando el planteamiento de Diesner/Carley y Leydesdorff/Hellsten para comparar las agrupaciones de temas tratados tanto en comunicados de prensa, como en resúmenes de publicaciones para el período comprendido entre los años 2008 y 2011. En términos generales, ambas enfoques arrojan resultados parecidos. En cuanto a la dimensión social, ambos muestran claramente que discursos diferentes pueden exponer, pero también ocultar, cosas diferentes. Así, en ambos planteamientos, se puede observar que el discurso científico de los resúmenes de publicaciones usa el término “mice” (ratones) para referirse al ensayo con animales. La Ilustración lo muestra basándose en el enfoque de Leydesdorff/Hellsten. Esto contrasta con los comunicados de prensa, dominados principalmente por términos que hacen referencia a los niños y a enfoques terapéuticos reconstructores relacionados especialmente con temas de corazón. En el caso de los niños y su proceso de crecimiento, es evidente que una terapia basada en el uso de células madre es una vía importante para la cura de enfermedades de corazón. Por otra parte, parece que la comunicación de cara al público evita en este caso el uso de temas espinosos como el del ensayo con animales. Curar a niños con enfermedades cardíacas parece beneficiar la imagen de un clúster de excelencia. El análisis general de los comunicados de prensa muestra una clara visión general de los temas principales del clúster de excelencia como se aprecia en la Ilustración 7. En resumen, podemos decir que para ambos casos (nano tecnología y biotecnología) los enfoques de Análisis de Texto mediante Red constituyen una forma muy práctica de exponer las diferencias entre el discurso público y el científico. Los comunicados de prensa así como los más difíciles de recopilar artículos de prensa representan una buena forma de reflejar el discurso público. En cambio, los resúmenes de publicaciones son posibles, puesto que se hallan a disposición de cualquiera sin el requerimiento de una suscripción a una base de datos o revista concreta. La dificultad estriba en la comprensión e interpretación de los términos científicos y sus áreas asociadas. En el caso de la nanotecnología, el poder entrevistar a los investigadores permitió entender con exactitud al poder preguntar directamente a los científicos. En cambio, y en el caso de la biotecnología- sin la posibilidad de contar con la opinión de los expertos- se hizo necesaria una intensa búsqueda en internet para poder entender los términos desconocidos e interpretar las agrupaciones encontradas.